We often hear, “good things come in small packages,” and it’s true. The world’s most amusing small car is now bigger, better and “funner.” I know “funner” is not a real word, but it accurately describes the new Mini Countryman. Yes, a car so cool, it needs a clever adjective: funner. In 1959, the iconic Mini landed on the global autoscape. The creative blueprint comes from the engineering mind of Sir Alec Issigonis. The diminutive, agile, fun-to-drive Mini was very revolutionary for its time. Issigonis reasoned by setting the engine crosswise and utilizing front wheel drive, so more space could be devoted to benefit the driver and passengers. Today’s Mini automobiles retain much of their classic heritage and unique design spirit. The urbanely chic street warrior is a playful, practical transporter for everyday commuters. On a critical side note, it’s much easier to park and fill up at the gas pump than my current mud wagon, a BMW X-5. Immediately after leaving the Niello Mini dealership, at my first stoplight, I noticed the Countryman sits higher than a Jaguar XJ6. Shocking, but true. The new four-door Mini Countryman is a big small car. If you position it next to a Toyota Camry you’ll be amazed just how full-sized the beefier-stanced Countryman is compared to its previous sub-compact Mini Brethren. In charismatic Mini-style, this city civil sedan delivers a very good-natured driving experience. It’s adult-sized fun, while remaining true to its youthful body style. 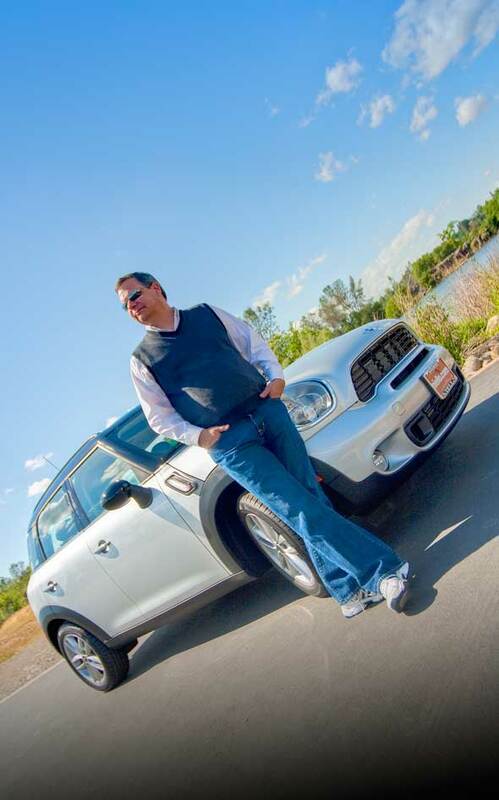 The Countryman makes it clear that you know “driving time” is “recess time” again. What’s not to love about a gigantic speedometer in the middle of the dash? The Mini interior is very good-humored with clean lines and lots of unexpected creature comforts. The retro aircraft-style toggle switches are wisely positioned for ergonomic friendliness. Brainy integration of the universal garage door opener buttons in the rearview mirror keep the cockpit clean and clutter free. The seats have excellent range; I have a few friends in the 6’4” and 6’9” variety and they felt enough head and legroom…impressive for a small, yet big car. Controls are smartly placed and interior layout of the Mini is intelligent and thoughtful. The color adjustable ambient lighting is standard on all Mini models, and it’s one of those, “Is this really needed types of features?” Yet, the changing interior light color always delights passengers. I found it to be one of my favorite features. Again it’s those thoughtful, fun and playful touches that keep Mini owners such brand fanatics. My Countryman came with the optional Harmon-Kardon sound system; it’s as if the Niello people knew I was an audiophile. The sound system gives you the feeling of really “being there”…WOW. Yes, being live at the concert or recital hall, it’s worth the extra dollars, when you consider how much time you spend in your car every day. The H/K system has a 400-watt amplifier pushing out tunes via eight channels to four tweeters, four mid-range speakers and two sub-woofers. Bottom-line: the Harmon-Kardon option is a top-shelf sound system that is acoustically tuned for the Countryman’s specific cabin configuration. If there was one thing I would like to share with engineers and designers at Mini, I’d say, with all due respect, “What’s the deal with your ‘bing-bong’ warning tone seatbelt alarm?” The time delay is instantly aggressive, because there is no time delay! Mini values safety so much that they “bing-bong” you to belt up instantly as orbital key is engaged. I’d much prefer to start the car then belt up. By the end of my week-long test drive I had radically altered my personal belting habits, after being “bing-bonged” into submission. Please tell me there is a software modification for this “bing-bong” issue? If so, then I’m buying a Countryman, because I love driving this car. Jim Pelley loves cars: Honda, Acura, BMW, Mercedes Benz, Saleen, and Volvo; he’s owned them all and now he reviews them for Style. The Mini Countryman is part of his Top Gear fantasy series.